Book in stores now, the index will not be updated. 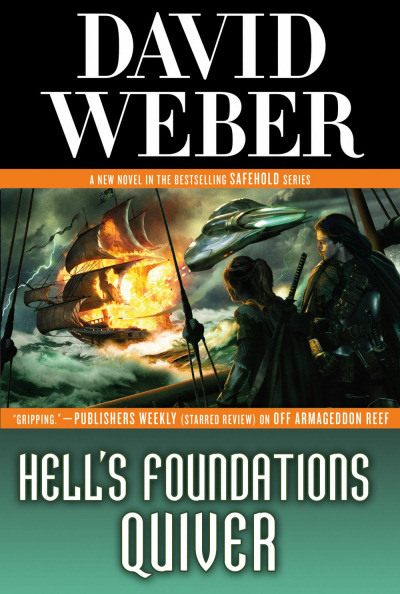 So, RFC has been so kind as to post snippets from the forthcoming book Hell's Foundations Quiver and to help everyone to keep track of what he has posted I started a new index for this. Note 3: Update on release date: The release date according to Amazon and Macmillan/Tor has been delayed to October 13, 2015. See book details on Macmillan and Amazon. Note 4: kbus888 has an index with all RFC's posts with relevant information for the different verses. Click here for the index. Note 5: RFC has made a post regarding updated maps for Safehold. 07/10: Added note 5 about updated maps. 07/09: Added snippet #27 & #27 part 2. Last edited by Joat42 on Tue Oct 13, 2015 7:19 am, edited 49 times in total. Doing this for LAMA was an enormous help, and I'm sure it will be again for HFQ. What he said. Goes for all of us. I hope you are busy! Thanks! SF & Fantasy: The only things better than Chocolate. TOR seems to prefer about a nine month period from turn in of original manuscript to publication (Baen seems to try to keep it to 6 months or less). MWW may have finished his first draft by the end of July, but he listed a number of other things that have to be done before TOR has a manuscript to work with. If that happens in the next couple of weeks we could see a mid May launch, but it will depend on where in their over all release schedule they feel they can get the best return on their investment. It could go one month earlier or three months later. ksandgren wrote: TOR seems to prefer about a nine month period from turn in of original manuscript to publication (Baen seems to try to keep it to 6 months or less). MWW may have finished his first draft by the end of July, but he listed a number of other things that have to be done before TOR has a manuscript to work with. If that happens in the next couple of weeks we could see a mid May launch, but it will depend on where in their over all release schedule they feel they can get the best return on their investment. It could go one month earlier or three months later. It's a pity that paper still dominates the publishing process. I bet that if they were willing to publish ebooks before the paper ones, they could shave 2 or 3 months off the process. That's a real WAG on my part, but I guess that the mechanical steps of printing, collating, binding, and distributing are an efficient but not that fast pipeline, and tho I am a big DW fan, I doubt he is an important / popular enough writer for them to consider bucking the queue.